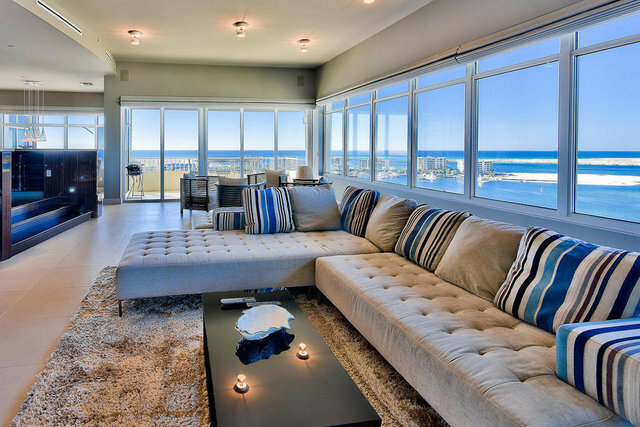 The glamorous interiors of this Destin Yacht Club penthouse are as special as its layered, panoramic view encompassing the lively Destin Harbor, East Pass, Gulf of Mexico, and Choctawhatchee Bay. Unique angles and varied elevations set a decidedly upscale tone that places this luxurious entertainer's paradise in a league separate from typical condos. Lustrous, custom wood cabinets pair effortlessly with sparkling quartz and sleek sheet metal in the elevated designer kitchen, overlooking the window lined living and dining rooms. Roman shades can be lifted instantly by remote control to reveal stunning sunsets throughout the year. Windows span the entire south side of the exceptionally spacious master bedroom. The backdrop of emerald green gulf water carries into the adjoining master bath, in front of which stands a modern soaking tub. The majestic view can even be enjoyed from inside the walk-in, marble-clad shower. Each guest bedroom features its own uniquely styled bath and walk-in closet. Black-out shades transform a sitting room off the living room into the perfect media room. Destin Yacht Club enjoys access to the harbor walk leading to shopping, dining, and entertainment at nearby Harborwalk Village. Boat slip 4 at the on-site marina conveys with the purchase of this penthouse. It capably accommodates vessels up to approximately 55 feet. Additional amenities include a secured lobby, coded elevator, private storage room, and waterfront pool.